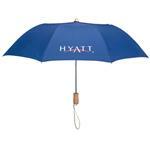 Our Executive Mini Auto Open/Close umbrella - a best selling umbrella. Small enough for a briefcase or purse and also great for travel. A tiny 10 inches in length when closed. A generous 43” arc to keep the rain out. One touch automatic open and close button. Strong Pongee material. Matching color rubber spray handle. Matching sleeve with bungee closure. 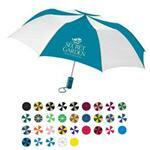 We love this mini travel size umbrella! 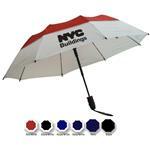 Available Colors: Black, Gray, Navy, Hunter Green, Brown, Royal, Khaki, Red. Typical Imprint Area(s): 7" w x 5" h.
Carton size: 11 3/4" x 10 1/4" x 20 3/4"